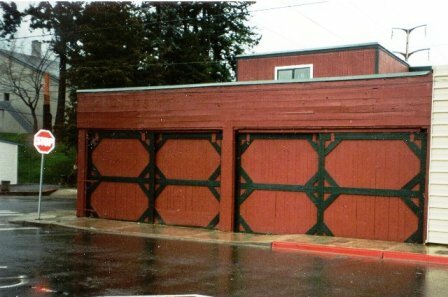 The former Issaquah Auto Freight warehouse is now use by the Issaquah History Museums as a workshop and collections storage. One of the Issaquah History Museums’ best kept secrets, the Restoration Shop contains a variety of tools, treasures, and vintage working machinery. Open house visitors can admire a set of Burma Shave signs, one of old Issaquah’s original wooden water pipes, a vintage Fairmont speeder used in track-work and repair, and the Issaquah Volunteer Fire Department’s first hose cart, circa 1915. The Restoration Shop boasts a working forge, antique drill press, and foot-powered grinding stone. Also on display is a 1920s Climax speeder engine, a restored 1948 Ford tractor, and several hit-n-miss engines. The restoration shop is located in the historic Issaquah Auto Freight building. The building was constructed by the Castagno brothers in the 1930s and used by their Issaquah Auto Freight company as a warehouse and garage. Its heavy roof beams were salvaged from the Black Diamond coal bunkers.